The German Shepherd Dog originated in northern Europe around one hundred years ago. The dogs were originally used to protect flocks of sheep and are still used for this purpose. More modern day uses also include: Police K9 work and as a multi-purpose service dog for the disabled. Personality: German Shepherds are loyal and dedicated dogs if they have a loyal and dedicated owner. They generally have a good sense of right and wrong and the ability to tell if something is amiss. been bred for high prey drive and high activity level. If the working dog does not have an outlet for this drive, they will get themselves into trouble (chasing cars, bikes, barking, chewing, aggression, digging and other destructive and unwanted behavior). * American & German show lines: Tend to be more angulated in the hindquarters. If not from good breed lines this may contribute to health problems such as hip dysplasia and spinal disorders. A shepherd from the working or either show lines needs obedience training, proper socialization with both people and other animals, daily exercise and play, and they must be a part of your family. These are working dogs that need a job, even if they are to be a family dog. Boredom and loneliness can lead to behavior problems. The German shepherds personality and activity levels vary from dog to dog. Genetics, training, socializing and the care they receive are a large part of the what determines each dogs personality. The German Shepherd has a double coat of medium length. The outer coat should be as dense as possible, hair straight, harsh and lying close to the body. This breed requires regular brushing and sheds a lot. The German Shepherd Dog varies in color, and most colors are permissible. Strong rich colors are preferred. Black and tan are the most common. The sable, gold with black coloration is seen frequently also. Pale, washed-out colors and blues or livers are considered faults. White and/or Cream colored German Shepherd dogs are not allowed to be shown at AKC events. Why are these dogs typically in animal shelters? The majority of German Shepherds in shelters arrive there as strays. Owner turn-ins are due to a variety of reasons. Currently, 2 of the most common reasons are owners moving (rental housing is difficult to find if you live with a German Shepherd. Landlord and insurance restrictions on many breeds, including German Shepherds, are now common.) and new baby and child versus dog conflicts. 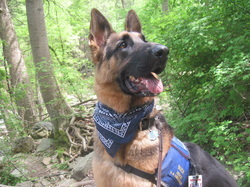 Other common reasons for owner turn-ins: Some German Shepherds arrive at shelters because of owner neglect and abuse. Others arrive because their owners were not able to provide for this breed's intense emotional needs, socializing, training requirements and improper behaviors, which usually develop out of frustration, lack of proper training and inadequate exercise. Basically - too much dog for an inadequate owner. Behavior problems can range from simple, such as house training, excessive activity level, digging, cat and dog aggression, property damage, to serious, such as human or stranger aggression and fear biting. Serious human or stranger aggression can be caused by their guarding tendencies, lack of socialization, abuse, or bad breeding. An unsocialized, untrained German Shepherd will not fare well in the shelter environment. A German Shepherd with a good foundation often will succeed in adapting to the changes that have come into its life. German Shepherds are sometimes shy or reserved in shelter facilities, but they should not exhibit aggression. Typically, German Shepherds are not happy in a strange kennel setting. Because they tend to bond more quickly with new people in a less stressful environment, they usually do better in a home foster care situation. How well they tolerate either depends heavily on the amount of human attention, contact and exercise they receive, as well as on the individual dog's temperament, training levels and past life experience. Being an extremely people-oriented breed, separation from their owners can cause severe distress. These dogs have a strong sense of belonging and when taken from their home, they grieve and show this sadness in different ways. Many will bark, cry, scream, pace and show stress or depression. If you go to a shelter to look at a German Shepherd you should ask that the dog be taken out of the kennel allowing you to visit, interact and play with the dog. The first impression, looking through the kennel door, isn't usually the dog's actual personality. The dog should be easily approached and allow you to pet it and walk it on leash. If a German Shepherd exhibits excessive fear, shyness or skittish behavior it could have some very serious issues and is not safe for the average owner. The dog may not slobber all over you and/or be desperate for your approval in the first visit, as they don't tend to seek attention from strangers. If the German Shepherd has a good solid temperament, given some time, it will bond with you and become your friend for life. Who should own this breed? A German Shepherd owner should be an extremely responsible person committed to the care, training and exercise of their dog. They should be knowledgeable about this breed and its needs. The heroic stories of German Shepherds and their lifesaving work and dedication for mankind are warming to the dog lovers heart, but they can also be misleading as these dog require a lot of time and work. Police dogs, seeing eye dogs, therapy dogs, good citizens award dogs; these dogs all got there with a good, involved owner/handler at the other end of the lead. Handling the German Shepherd Dog: German Shepherds should never be allowed to roam loose in any public areas, or around strange dogs. German Shepherds should be securely contained when not supervised by an adult. The German Shepherd generally does best with a good fenced yard for their safety and exercise. These dogs must be included in the everyday activities of the household. If you are thinking of getting a German Shepherd and leaving it in the backyard with limited family contact, then both you and the dog will be miserable! These dogs require a large commitment of time and energy from the owner. They do not come as a good to go dog and will be a reflection of the owners effort and commitment. This breed should be spayed/neutered. Un neutered males can become male dog aggressive and hard to mange and are predisposed to some cancers. Unspayed females can become moody/difficult and predisposed to uterine problems and cancers. German Shepherds tend to love and be dedicated to their human family and can be especially fond of children. The dogs temperament, socialization, and training levels all need to be considered. These dogs can have a natural herding and prey drive instinct that can be a conflict or a danger with children. Like children, each dog is different in personality, energy and patience levels. So, each dog and child relationship should be considered individually. Children and dogs should never be left alone and unattended, even for a moment. Young children do not have proper dog etiquette and dogs do not understand a child's behavior. This can result in tragedy with any breed of dog. Is this breed good with other dogs in general? German Shepherds generally do well with other dogs if they have been socialized and trained properly. Socializing your Shepherd with other dogs is important from day one. For German Shepherds, spaying/neutering is one of the most important keys to having a dog-friendly animal. Pack position is important and will affect and vary each dog's acceptance of other dogs. How easy is training and house training with this breed? German Shepherds are highly intelligent and generally, if in tune with their trainer and or pack leader, they can learn some tasks in 2 to 10 repetitions. Like humans, each dogs abilities, likes and dislikes will vary. In general a learning German Shepherd is a happy German Shepherd. Good training gives the German Shepherd and all dogs the ability to speak the same language with us. These dogs learn so quickly it is pretty easy to confuse or teach them bad habits if one is not careful. Give a German Shepherd good structure, commitment, leadership and rules in their life or they will structure their own life and make their own rules. These dogs should attend regular classes with a good instructor. The time required to house train a German Shepherd will vary depending on each dog and on the method used. Positive methods and consistency will work best for all training with this breed. Crate training seems to be of great assistance for most dogs in house-breaking. Socialization is one of the necessary requirements to successful German Shepherd ownership. Training and socializing is a must, not an option. This breed is reserved with change, so they need to be continually exposed to a large variety of environments and experiences. They should be taught social skills and manners early on and on an ongoing basis. A German Shepherd should exhibit a reserved-to-friendly personality with strangers and should not be aggressive. A German Shepherd that shows aggression, excessive shyness, or skittish behavior should be evaluated by a professional trainer and behaviorist immediately. The unsocialized German Shepherd can be dangerous. When socialized and not properly trained, this breed can become prone to fear biting, uncontrolled prey drive instincts, inappropriate herding traits, and dangerous guarding instincts. Since it is so highly intelligent, if it's protective and herding nature is not channeled properly, it can lead to serious trouble. These dogs shed a lot. If you are offended by dog hair do not get a Shepherd. Some German Shepherds are not good with small animals or cats. They can also have livestock issues, due to their herding instincts. Because of the lack of available rentals to high risk breeds, would be German Shepherd owners need to consider the possibility of any future moves that might put their dog's life at risk. One of the main keys to successful German Shepherd ownership is ongoing, positive obedience training and socialization. The German Shepherd can be the dog and friend of a lifetime in the hands of a loving, committed, involved owner. Picture Below: Phantom & Casper (Adopted) Plus GSD Friend. German Shepherds come in different Colors, have Different Personalities and Temperaments we are here to help create a good match based on our dogs physical, emotional needs compared to our Adopters, Lifestyle and Home Environment.